Enginursday: CES, You should go next year. 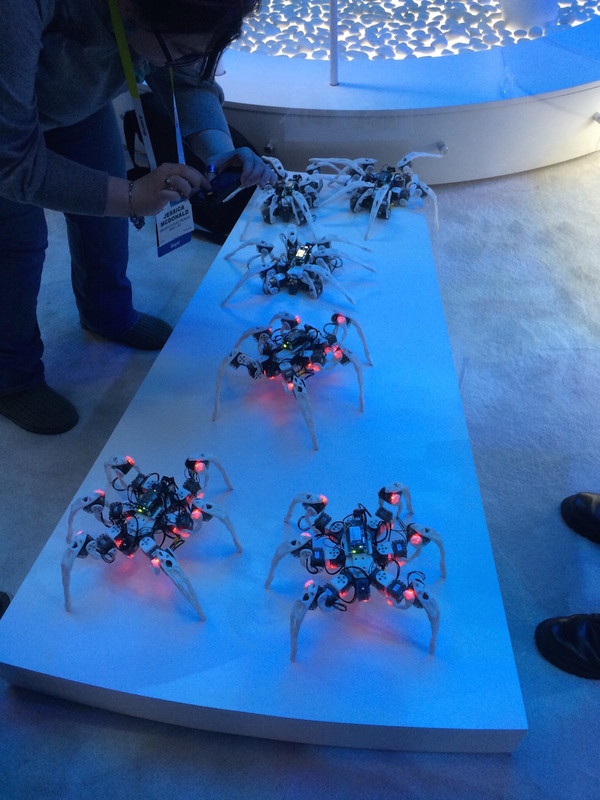 My experience at CES 2015 and my thoughts on attending. For the second year now, I had the opportunity to represent SparkFun at the International Consumer Electronics show. If you're not familiar with our presence there, check out my post from last year. As with most years, the show is giant and we weren't able to see everything. But there was still lots of cool stuff to be seen. CES from the outside (okay and the inside) might not seem to be for everyone. Huge crowds, loud dance and house music, and miles of walking can put off the most seasoned veterans. It was incredibly difficult to get our head of engineering, Pete, on board to come to this because of these things... and some distrust of myself relating to a Tiësto show, but you'll have to ask Pete about that. Can you guess which days I was at CES? The thing I've heard more than anything that puts people off coming is the lack of interesting technology. I admit, we're a bit spoiled in our area of interest. We're playing around with technology that has a few years before it makes it into consumer or finished projects. But there's cool stuff to be seen, you just have to look a little harder. The folks at OpenBionics are doing amazing things. This gentleman had a fully functional, 3D Printed, bionic arm. At one point he couldn't explain the project as he was too busy shaking hands with everyone with the arm. In a lot of cases, it's not what the technology is, rather what's being done with it. There was a lot of situations where I saw products that used a technology I had been aware of, but in a manner I never thought of. What seems like a bad idea, Audi's lazer headlights are actually quite brilliant. Increasing your visibility while not effecting the visibility of others. Cough, Cough Xenon Headlights. I was unable to get a great picture of the two dresses made by Anouk Wipprecht at the Intel booth, but they were astounding! Well done and functioned perfectly. 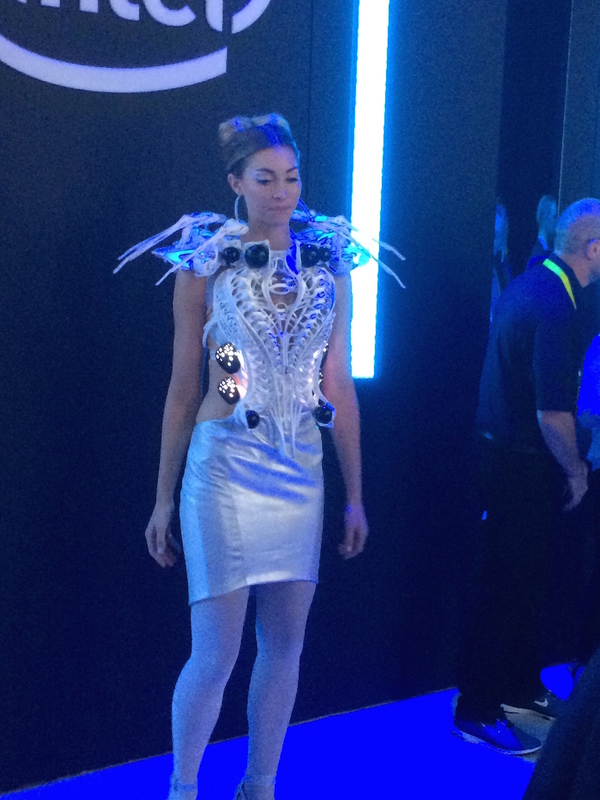 The dresses even had matching hexapod bots! But where I disagree most with this sentiment is that CES is so much more than new technology. I'm personally not one for Comic-Con, so in a lot of ways, CES is the big nerd event I look forward to every year. A place where the majority of the people there hold the same interests as me and it's easy to explain your latest project without going into the basics of electronics. Everyday after the show closes, there are numerous meetups held by companies or interest groups where it's easy to meet new friends or talk to people with similar interests. While we didn't make it to any official meetups (reference the graphs above) we were able to meet up with a few friends every night. A great aspect of the show being in Las Vegas is there's no shortage of interesting bars to meetup at. One such meeting turned into a tour of kinetic art on the strip. So to conclude, if CES is something you've written off, I beg you to reconsider. There's so much more to it when you come with a participation mindset rather than an observational. Furthermore, as the maker/hobbyist community and consumer electronics community come closer together, you'll find more and more things that could pique your interest. So the most asked question I got while I was there was "what is the coolest thing you saw?" I really wasn't impressed with most stuff in the way one might be (OK, so sometimes I feel that way too). I admit, I didn't want to wait in the line at the Oculus booth, but I think I would have been impressed with the progress made with it. What did impress me was the 8K TVs. Have you ever been watching TV and a place you've visited comes on and you think "I've been there, it looks nothing like that". Well my impression with 8K is it will look exactly like what it looks like in person. Bonus pic of the Oculus booth, it was pretty impressive and had a line around the corner. I'm going to lobby with the higher ups to sponsor a meet up for next year. So stay tuned for more information or a very disappointed Pearce. Awesome! Really well done project. Testosterone, lots & lots of testosterone at that show. You survived "CES 2015"! Spent all my CES week running demos (my employer's booth was on the Central Plaza). I didn't count my CES footsteps.... Arthroscopic knee surgery just one week after CES 2015 has me thinking twice about next year! Ah, I've been personally avoiding the ole scope on a meniscus tear. Hope it's made things better. The 3D printer section was HUGE, there had to be at least 50 companies there with a printer. I wasn't as impressed with most, no huge leaps in technology or accuracy. There were a couple with big print areas, but nothing too spectacular. But yes, lots of people crowding the area to see them. Drones are starting to get scary accurate. The show they put on with the Parrot AR was as terrifying as it was entertaining. Hmm... I'd have to have lunch near an electric outlet so I could recharge my scooter. No way I could walk the distance and it's further than my scooter could get one a single charge. I saw a good amount of mobility scooters there, it might not be as difficult to get around as you might think. Another thing to take into account was the somewhat random location pattern of our meetings throughout the show. We were running back and forth a lot to make meetings in different locations. There are so many people there, you wouldn't be able to use it, and they probably won't allow it either. CES isn't open to the general public is it? I had the good fortune of going as my employer had a booth, and it was definitely an experience. That is the bummer part. It's a really cool conference that I think a lot of people could benefit from. CES used to be open to the public, but now you have to be part of a consumer electronics company to even attend.